← Mission or accompaniment – do we have to choose? 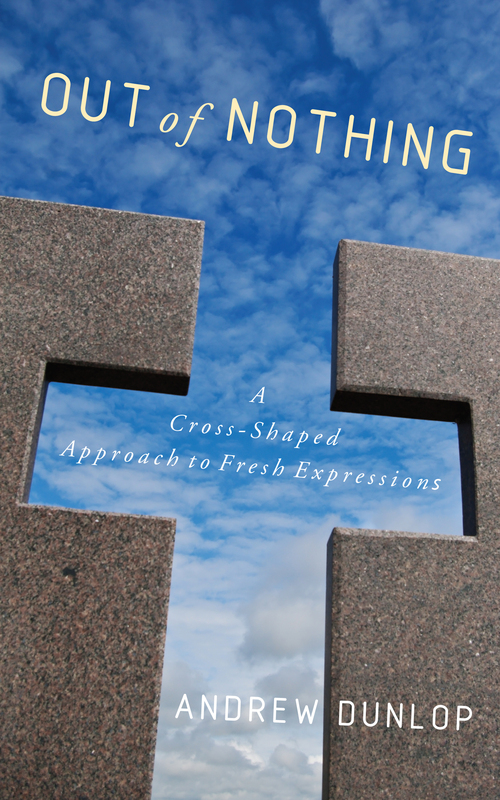 I have recently written a blog which has been published on the SCM Press blog site, based on my forthcoming book, Out of Nothing: A Cross-Shaped Approach to Fresh Expressions. This can be ordered from most online book retailers. You can pre-order direct from SCM Press for the special price of £15.99. I consider myself a pioneer. I was not ordained as a pioneer — that designation hadn’t quite come into use at the time of my selection by the Church of England, and in any case at that point in my life I was still getting my head around calling to ordination, never mind anything else. Over the course of my training and curacy I became more and more inspired hearing stories of Christians doing innovative things in order to reach out to those beyond the fringes of Church. The Fresh Expressions movement was just beginning. After training, I was a curate in Plymouth, and the nearby TubeStation, the surf-church formed next to the beach of Polzeath, Cornwall, was just starting to make waves (if you will excuse my expression). At the same time in Plymouth I was a part of a very successful ministry to parents and toddlers set up by the previous curate. A popular mothers and toddlers group had been running for some years on Friday mornings, yet beyond using the church hall and interacting with the volunteers, there was little flow into church life. The previous curate saw the missional potential of that popular group and brought in three simple changes. First, they were to offer holistic hospitality. Volunteers began not only to welcome people, and serve the tea and cakes, but to actively take an interest in the lives of those who came. In fact, each week people would be on the rota simply to ‘be’, not to ‘do’. Second, they became unashamedly Christian. This didn’t mean forcing anyone to worship, but a simple change of focus during the closing group story and song time gently introduced Bible stories and Christian children’s songs. These two changes, in particular the trusting friendships that formed between church members and parents, paved the way for the third. A Christian basics course (in this case, Christianity Explored) would be offered at the same time for anyone who wished to take part. The parents were already used to coming to the building at that time, and because they knew and trusted the volunteers, they were happy to leave their children in their care for and hour. These changes resulted in a fair number taking the course and making professions of faith. Some also joined the Sunday morning family worship congregation and midweek house groups. However, out of those who professed faith, only relatively few made the jump to Sunday morning. What was happening? I came to think it was two things. First, although the Sunday morning service was lively and friendly and full of families, there was still a significant culture gap. The parents had come to faith by watching short punchy videos, having engaging discussions, and praying together. Sunday mornings required them to sing corporately and sit and listen to a 25 minute teaching slot. There was no time for discussion. Bible teaching was important to me, and important to the church I was a part of and this shaped the form of church that occurred. Even though these Sunday morning Bible expositions were usually engaging, they were a far cry from the interactive participative mode of discovery that the new Christians had experienced in coming to faith. Second, these new Christians, from unchurched backgrounds, simply did not prioritize Sunday mornings. There were many other competing demands on their time. What I came to realize in hindsight (but unfortunately only after I’d left Plymouth! ), was that a better approach may have been to make Friday mornings their ‘church’. Like many pioneers and church planters I became concerned that the way we were doing church was not making it easy for those new to the faith to fully engage and I started investigating fresh expressions of church. I was appointed to a pioneer role on a new-build development on the edge of Northampton and began to try to put these principles into practice. I wanted to make disciples, and I thought the best way to do that in a new development where there was no pre-existing community would be by creating community — something most residents were hungry for. After five years we ended up with a network of neighbourhood activities which aimed to bring people together. Alongside these were various groups that enabled people to explore aspects of faith. The story of what we did is told in Out of Nothing: A Cross-Shaped Approach to Fresh Expressions. In my case, as in the case of the traditional church I where served my curacy, theology shaped the church. My approach was based on a desire to see people come to faith which arose from my understanding of mission. This then drove me to create close community (koinonia), and from there to make disciples and form church. Theology shaped my missiology which shaped my ecclesiology. In other words, what I believed about God – who he is and how he interacts with the world – affected my understanding of mission which then shaped how I formed the new church. This is an important realization, and it is worth reflecting on the theology we bring into a new venture, as this will inevitably affect the shape of church that emerges. This is one of the central arguments of systematic theologian Peter Schmiechen, who, first in Saving Power: Theories of Atonement and Forms of the Church, and then in Defining the Church for our time, argues that Christology and ecclesiology are inextricably linked. For example, he claims that a concentration on Christ’s incarnation leads to a sacramental understanding of church. A theology which emphasizes scripture and a personal response to faith (most often communicated alongside a justification or penal substitution theory of atonement) can result in a church that is heavily intellectual and teaching-based. Different atonement theories can affect the practical outworking of church with regard to how the sacraments are understood and practiced and how Christians are encouraged to respond to Christ, what the role of the Holy Spirit should be, how one participates in community, how the church engages in service to others or shows solidarity with the suffering. Later Schmiechen focuses on a different element of Christology, indicating that the promise of Christ’s return offers hope for the present, thus shaping the church into becoming ‘communities of hope’, which ‘see, celebrate, and pray for the coming of the Kingdom.’ This approach could then reveal itself ecclesiologically in churches which aim to bless the community through practical service and social action. Taking this idea that theology shapes missiology which shapes ecclesiology, in my book Out of Nothing, alongside telling the story of my experience of birthing a new form of church, I have tried to assess different approaches to theology and their value in forming missional church. As I looked back and saw what God was doing, I wondered whether a theology that began from a place of encounter (based on Christ’s once-and-for-all and ongoing work of atonement) may be a better place to start. In the big picture, God’s action comes about entirely through Christ’s work in his incarnation, death, resurrection and ascension. Within the atonement we find reconciliation, salvation, sacrifice, forgiveness, victory, justification, sanctification and so on. I certainly saw God in action in these ways in the lives of those we lived amongst on our new-build development in Northampton. What would a church look like if its primary work was understood as creating space for God to be known and experienced? It would be a place where people could come to experience justification, reconciliation, sanctification, and the whole breadth of Christ’s atoning work in their lives and in their communities. Peter Schmiechen, Saving Power: Theories of Atonement and Forms of the Church, (Grand Rapids, MI: Eerdmans, 2005), pp. 353–7. Peter Schmiechen, Defining the Church for Our Time: Origin and Structure, Varied and Viability, (Eugene OR: Cascade, 2012), pp. 112–3. This entry was posted in books, community, ecclesiology, theology, Uncategorized and tagged Fresh Expressions, Peter Schmiechen. Bookmark the permalink.